Fuelled by her desire to be competing in the Olympic Games at the age of 46, Catriona Matthew maintained her encouraging start to the season by getting on to the leaderboard in the ISPS HANDA Australian Women’s Open in Adelaide. Matthew, whose first victory as a professional came in the same event 20 years ago, opened with a five-under-par 67 at The Grange to sit joint-fourth on a day when Canadian-based Korean SooBin Kim set the pace with a course-record 63. “I’m pleased with a good start,” admitted Matthew after signing for six birdies - three in each half - with her only blemish being a bogey at the par-4 sixth “I played well, giving myself a lot of chances. Falkirk-based American Beth Allen also made a promising start, sitting joint-10th after her 69, while Kylie Walker was just outside the top 20 after a 70 that was illuminated by an eagle-2 at the 11th, her second hole. On a day when world No 1 and defending champion Lydia Ko shot the same score as Walker, Kim opened up a three-shot lead over American Casey Grice after a flawless nine-birdie salvo. Stephen Gallacher shrugged off his poor recent form to make an encouraging start in the Maybank Championship, which is being played at Royal Selangor in the Malaysian capital of Kuala Lumpur. The 41-year-old, who missed the cut in all three of the recent Desert swing events on the European Tour, carded a three-under-par 68 to sit joint-20th, four shots behind leader Nathan Holman. “Today was a lot better,” admitted Gallacher of a round that was illuminated by an eagle-3 at the 15th and also included four birdies. David Drysdale and Simon Yates both signed for 71s to sit in joint-67th, but Marc Warren was lying tied for 102nd after a 73 that included an eagle and three birdies but too many blips mixed in. Holman, a 24-year-old from Melbourne, claimeds his maiden European Tour win on home soil in the Australian PGA Championship in December before recording top-40 finishes in Qatar and Dubai recently. Another on-form player, Dubai Desert Classic winner Danny Willett, covered his last 11 holes in seven-under-par to sit as one of Holman’s closest challengers alongside fellow Englishman Tommy Fleetwood, American Peter Uihlein, Spain’s Jorge Campillo, France’s Alexander Levy and Angelo Que of the Philippines. Former Open champion Louis Oosthuizen sit two shots further back while two-time major winner Martin Kaymer had to settle for a level-par 71. Scott Henry emerged from an up-and-down day to sit as the leading Scot after the first round of the Sunshine Tour’s Dimension Data Pro-Am at Fancourt. Playing on the Montagu course, the 28-year-old raced to the turn in 32, four-under, before picking up his fifth birdie of the round at the tenth. His momentum was halted, though, by three dropped shots in a row straight after that gain before a bogey at the last left him having to settle for a one-under-par 71. That left the former Scottish Stroke-Play champion sitting in joint-59th, just ahead of compatriot Jamie McLeary after he carded a 72 on the same layout. South African pair Brandon Stone and Jaco Van Zyl share the lead with Italian Francesco Laporta after they all shot seven-under 65s on the Quteniqua layout. Scott Borrowman is facing a race against time to be fit for the start of the PGA EuroPro Tour season after missing six weeks’ practice due to a wrist injury. 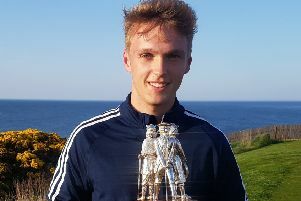 The former Scottish Youths’ champion has already had to scrap plans to play on the Med Tour, where he recorded a maiden professional win in Egypt last March. “I picked up the injury in early January and it’s just through too much practice,” said Borrowman, who turned professional last year at the age of 28. “I tried to come back to early and made it worse than before. It’s been six weeks so far and I’m still a few weeks from full practice . The third-tier circuit stages its Qualifying School in early April at Frilford Heath, where the first regular event of the new season also takes place the following month. “I have category 11 membership and that played every event last year, but I may go to Q School and improve on that if injury doesn’t stop me,” added Borrowman. Stirling University finished joint-seventh out of 15 teams in The Prestige, an event at PGA West in California featuring all of the top American college players. Louisiana State University won by 18 shots with a 26-under 826 aggregate. Spaniard Jon Rahm, the world No 1, helped Arizona State finished second. Recovering well from an opening 76, Wallace Booth closedf with sub-par efforts of 69 and 68 to finish eighth in an Evolve Tour event at Lo Romero Golf Club in Alicante. With a three-under total, the Eisenhower Trophy-winning team member finished just four shots behind the joint winners, German Florian Fritsch and Jordan Gibb from England.